Planning a Grass Roots wakeboard, wakeskate or wakesurf event for 2018? 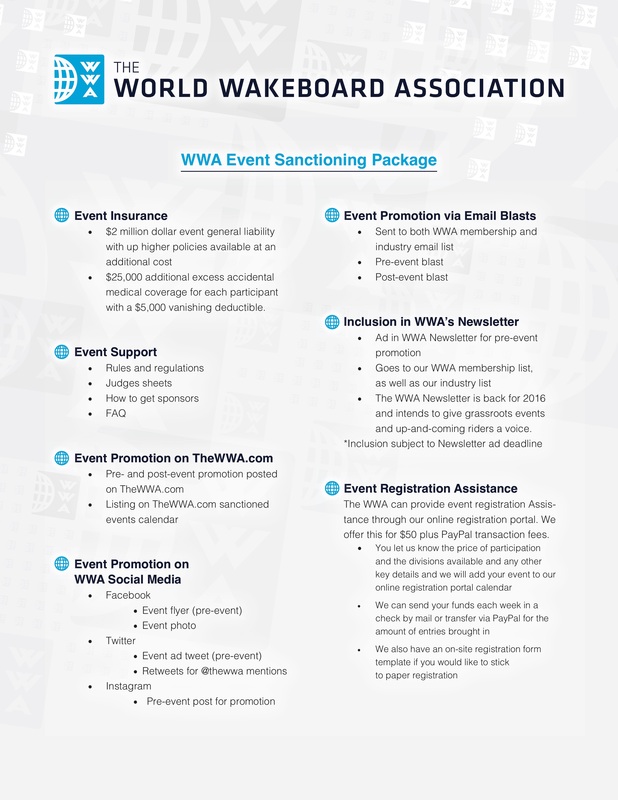 The WWA is the best place to start for all your sanctioning and planning needs for a successful and fun event. Whether you would like to hold a contest, clinic or demo we can assist you to help your event run smoothly. We provide the tools you need for all your sanctioning, memberships and media announcements. Contests. Holding a contest in your local area is a fun way to introduce competition to your local wake scene. Encourages riders to progress their riding and challenge their ability on the water in a fun non-intimidating atmosphere. Demos. A great way for shops, boat dealerships and/or cable parks to get their customers out to try new gear before they buy. Helps riders to be on the right equipment for them, which will ultimately allow for riders to have more fun and progress faster. Clinics. Are typically put on by local boat dealerships for either a customer appreciation day or for lessons by a professional instructor or Pro rider; where some areas may not have access to that level of instruction. A great way to help progress riding safely and properly. Clinics can be sanctioned in private or public environments, the world is your oyster. The WWA is passionate for wake sports. Created by riders for riders, the WWA is a non-profit organization dedicated to the advancement and progression of wake sports worldwide. We do this by sanctioning and supporting wakeboard events on a global level. Click here to learn more about the WWA. Founded in 1989, the WWA has seen wake sports grow from its infancy to an awesome international sport. There have been ups and downs in our industry’s short history, but one thing has remained the same; the WWA has always been an industry leader in wakeboarding, wakeskating, and wakesurfing. Is the WWA a good fit for your event? The WWA supports event organizers by providing sanctioning and insurance for all types of wakeboarding, wakeskating, and wakesurfing events. Reap in the benefits of push publications on the front pages of thewwa.com, FB.com/TheWWA, twitter.com/thewwa, and our massive e-newsletter. Forms take just minutes to fill out and within a couple of days, you’ll have your certificate of insurance and be ready for a great wake event. Feel free to call or email the WWA with questions or comments. CLICK HERE FOR SPECIAL RIDELINE PRICING FOR EVENT ORGANIZERS!